No Smoking, No Pets, & No Vaping: In Cabins, Campsite Owned RV’s, Pool Area, Bathhouse, and/or Restrooms. Please dispose of all extinguished cigarette butts in proper container. Parking: One vehicle per site, or pay for extra vehicle $5 per car, per day. Visitors: Must stop & register in office before entering park & exit by quiet time of 10:00 pm unless staying the night. $5.00 per guest, per night paid in advance. Pets: Must be kept on leashes at all times. Always keep on leash in your control. Always cleanup after your pet. Pets are not allowed to be left outside unattended. Pets aren’t allowed in public pavilion areas, pool area, bathhouse/restrooms. You are responsible for any damage caused by your pet on park grounds. Garbage: Should be placed in dumpster in front of pool area, side next to wall opens. Please don’t leave garbage or food outside unattended, due to wildlife in the area. Wildlife: DO NOT feed or approach any wildlife. Alpine Hideaway Campground assumes no responsibility of any kind due to injury from wildlife. Hold Harmless: Alpine Hideaway Campground is not responsible for any injury or damages while staying or visiting the campground. Campfires: Only allowed in fire rings. DO NOT burn trash in fires. Pool: No lifeguard on duty. No minors under the age of 16 allowed without adult supervision. See sign or ask about pool hours. Alcohol: Allowed only in cozies or plastic cups. No glass or cans exposed to public in park. No one under 21 shall use alcohol on premises. Bathhouse: Only for registered nightly guests. Sites: One camping unit & one vehicle per site. All vehicles will be issued a campground tag which must be displayed in front window. No vehicle repairs, washing of vehicle/campers on site. Extra vehicle parking may be subject to extra fee. Sewage or Graywater: All sites are equipped with proper disposal. No disposal of sewage or graywater on grounds. Laundromat: Only for nightly registered guests. DO NOT leave machines unattended. No clothes lines @ sites allowed. Gate Code: All guests will be given a gate code. Code is NOT to be given out to anyone. Unauthorized vehicles will be towed @ owner’s expense. Reservations: Deposit equal to one night’s stay is required at time of reservation. If you reserved to stay more than one night & cancel upcoming nights after arrival or less than days required by designated cancellation policy, you will be charged a 2nd night. Cancellation: RV site cancellation must be received 7 days in advance unless holiday or special event and then 14 days in advance is required. Cabin cancellations must be at least 14 days in advance in order to receive 80% refund. 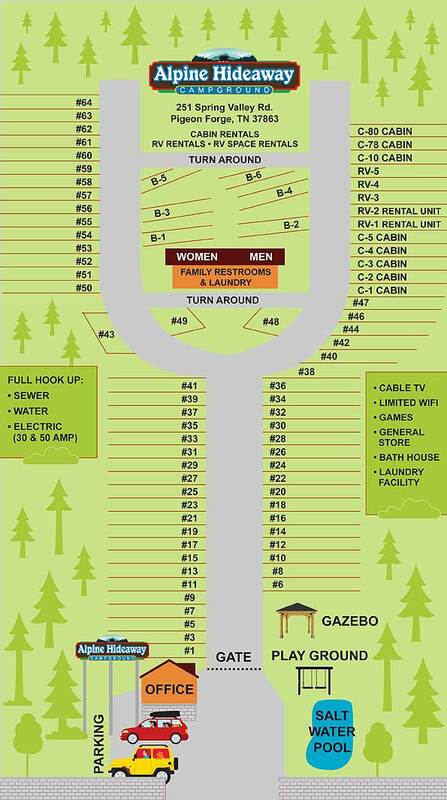 Cabin and/or RV Rentals: Linens are furnished, will need to bring towels, etc., for bathhouse. Any items damaged or taken from cabins will be charged to credit card on file. NO SMOKING and NO PETS allowed in Rental RV’s or Cabins. ANYONE BREAKING THESE RULES MAY BE ASKED TO LEAVE WITH OUT REFUNDS. THIS IS A FAMILY ORIENTED CAMPGROUND. PLEASE BE COURTEOUS AND RESPECTFUL TO YOUR NEIGHBORS. PLEASE BE MINDFUL OF YOUR LANGUAGE. Our Goal is to make your stay memorable and enjoyable.